Late fall Moose Hunts are conducted on snowmobile or ATV during a time when new hunting country opens due to frozen ground conditions. Gear up for a 7 day, fully guided hunt from a remote wilderness cabin located in a prime area with very low seasonal hunting pressure. This is a time of great opportunity to access areas where the ground is too wet for travel during the early hunting season. We take clients into remote areas using the advantage of frozen ground to cross the muskegs and beaver ponds that stand between us and what we call the “moose’s living room”. This season offers the advantage of hunting potentially several bulls at the same time, as the bulls bunch up in the feeding areas to replenish the fat reserves following the rut season. 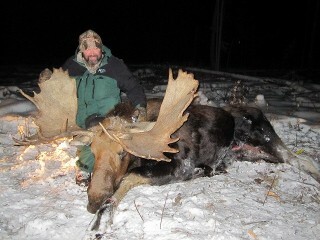 This cold weather hunt is based from a warm, insulated cabin in the heart of moose country. Timber Wolf is always included on our hunts. If hunting in WMU 534, Wild Buffalo can be included on your hunt for a $1000 harvest fee.